Wall hangings, another finished quilt, & late night blogging! Ok, about a week ago I made some cute fabric wall hangings for my living room & I wanted to share them. I got the general idea here, but I tweaked it a little. (By the way...how cute is that blog?! She has the cutest ideas). It was fairly inexpensive project (around $20 I think, and it took about 15 minutes to make). I went to Hobby Lobby to buy canvases & was pleased to see that they had 2 -packs of canvases on sale for $7.99. Good price, right? They were also 30% off. I'm no mathematician but I think that's just over 10 bucks for 4 medium sized canvases! So I got my canvases and I headed to JoAnn's for fabric (Hobby Lobby also has fabric, but I browsed their section & it was pretty picked over & I had specific fabrics already in mind for this project). I got a 1/2 yard for each of my fabrics and headed home. I usually buy a 1/2 yard of fabric when I do my quilting because I can get 2 fat quarters out of it...I found in making these wall hangings that a fat quarter would actually work perfectly for the canvas size I bought. Anyways, the only other tools I needed for my project were an iron (the fabric needs to be completely wrinkle free, or else you are not going to be able to take your eyes off of the hideously wrinkled wall hanging above your TV!) & a staple gun. In the tutorial she uses a staple gun to attach the fabric to the canvas, but I don't own one of those. But I do own a hot glue gun! It worked perfectly. I glued the top & bottom first (make sure you stretch the fabric all the way around to the back of the canvas to glue it so that no unfinished edges are showing). Then I made sure to fold the corners all pretty & neatly, kind of like when you're wrapping a present. Then I glued the sides & it was done! 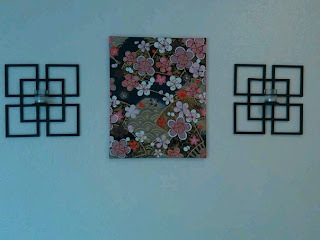 The blog tutorial also showed how to get all fancy & add some texture to the wall hanging, but I didn't go that route. You can if you like, but I didn't have the patience for it & I wanted a quick crafty thing to do for some instant gratification. I really wanted them all going vertically though! Dang it. Oh well, they still look great, but maybe one day I will redo them & have them all going the correct way. What do you think of them being arranged this way? 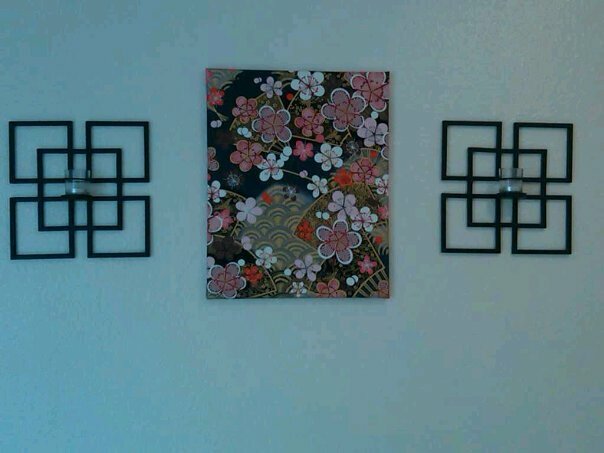 I had one canvas left and I wasn't sure what to do with it, so I found some really cute Asian themed fabric I had leftover from my Asian inspired quilt found in this blog I wrote. I made this in about 2 minutes & stuck it in between some wall sconces I have hanging in my foyer. I think it turned out pretty cute! By the way, I got a message from a friend of mine who lives in Alaska & writes a blog called One Me, Two Monsters. Her name is Amber and I absolutely love her blog. She recently started doing this thing every week called Featured Friday and she asked if I wanted to be her Friday tomorrow! All I had to do was write a little paragraph or two about myself and she puts it up on her blog. I'm in the process of making a button for my blog page and when I do she will put a link up to my page and I will put a link up to hers as well. You should give her blog a read...like I said, I love it! And I LOVE the DIY wall hangings!! that quilt looks so good! you did an awesome job! i like the contrast of the front dark brown with the light pink backing! LOVE the wall hangings. Super cute!